Learn how your school can support positive behavior and your students' social and emotional development. Promoting positive student behavior is one of the most important parts of developing a happy and healthy school climate for students, staff, and families. School-wide PBIS initiatives are excellent launching points for the development of successful social and emotional learning (SEL) programs. The inclusive and all-encompassing nature of school-wide PBIS aligns well with the goals of SEL programs and support structures can easily be built to address the fidelity of both programs because of their complementary features. 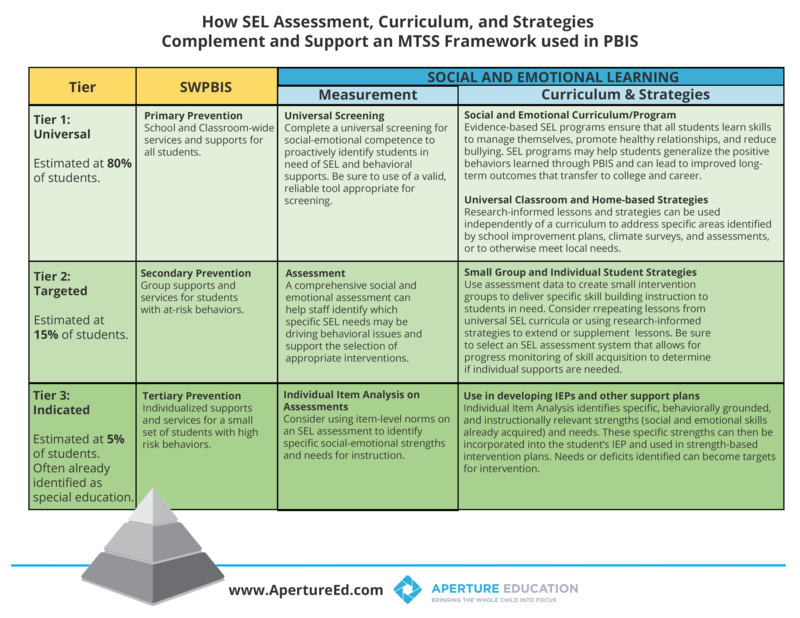 This detailed crosswalk will lead you through each tier of the MTSS and framework and provide an easy guide to integrating social and emotional learning (SEL) into your PBIS program. Download the guide here. We encourage you to share this with your staff—specifically those that work with your Tier 2 and 3 students—as this guide is an excellent resource to help guide SEL implementation. It can seem like a daunting task to implement any new initiative—especially if staff buy-in is lukewarm at best. The relationship between PBIS and SEL is clear, research shows that when these initiatives are integrated, programs make improvements at a higher rate. Barnstable Public Schools is an excellent example of how a successful PBIS and SEL integration can work. Take a look at their website for detailed information on how they use both initiatives to support their staff and students. Aperture Education and Kickboard have recently joined forces to offer schools a quick and easy solution for integrating PBIS and SEL practices. Download our free resource, the DESSA SEL Inventory, to learn how you can begin successfully implementing a blended program at your school. Join us as we discuss end-of-year planning with Katie Gordon, an elementary school principal from Indiana. This webcast will provide a framework to help you analyze the impact your PBIS and SEL initiatives have had on school culture this year, plan necessary adjustments, and set appropriate goals and action steps for next year. As we all know, a positive school culture helps students feel safer and more secure in their classrooms, a natural deterrent to negative behavioral issues. Aperture Education and Kickboard are excited to offer a well-rounded, whole child approach that focuses on measuring, building, and sustaining student skills. By leveraging the DESSA Behavior Inventory, schools can now focus on supporting a healthy climate for learning. To learn more or discuss pricing, please fill out the form on the right. Interested taking a tour of the Kickboard and Aperture Education integration? Schedule a demo by filling out the form to the right.